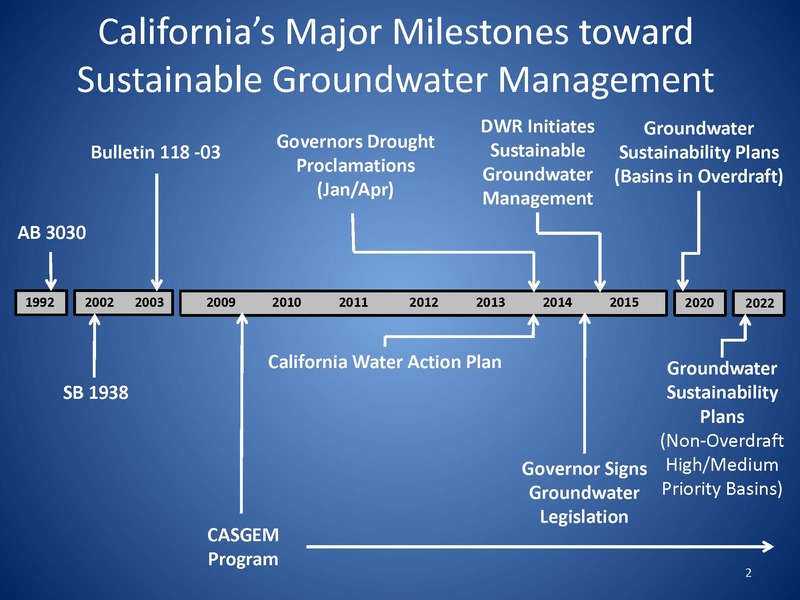 The Sustainable Groundwater Management Act (SGMA) established a new structure for managing California’s groundwater resources at a local level by local agencies. SGMA requires, by June 30, 2017, the formation of locally-controlled groundwater sustainability agencies (GSAs) in the State’s high- and medium-priority groundwater basins and subbasins (basins). A GSA is responsible for developing and implementing a groundwater sustainability plan (GSP) to meet the sustainability goal of the basin to ensure that it is operated within its sustainable yield, without causing undesirable results. The GSP Emergency Regulations for evaluating GSPs, the implementation of GSPs, and coordination agreements were adopted by DWR and approved by the California Water Commission on May 18, 2016. The legislative intent of SGMA is to recognize and preserve the authority of cities and counties to manage groundwater pursuant to their existing powers. As such, local governments play an important land use and water management role in California and should be involved in GSA formation and GSP implementation. Domestic Well Users and SGMA - Click here for a handout from the State Water Board that should answer many questions that domestic well owners have about SGMA. There are 515 alluvial groundwater basins and subbasins in California as defined in DWR's Bulletin 118. These basins contribute close to 40 percent of the California's annual water supply in an average year and as much as 45 percent in dry years. During extensive dry or drought years, groundwater can provide close to 60 percent of the water supply. Statewide, approximately 30 million people, or 80 percent of Californians, live in areas overlying alluvial groundwater basins. Some communities are 100 percent reliant on groundwater. The California Department of Water Resources (DWR) implemented the California Statewide Groundwater Elevation Monitoring (CASGEM) Program in response to legislation enacted in California's 2009 Comprehensive Water package. As part of the CASGEM Program and pursuant to the California Water Code (CWC §10933), DWR is required to prioritize California groundwater basins, so as to help identify, evaluate, and determine the need for additional groundwater level monitoring. Any other information determined to be relevant by the Department. The CASGEM Groundwater Basin Prioritization (Basin Prioritization) is a statewide ranking of groundwater basin importance that incorporates groundwater reliance and focuses on basins producing greater than 90% of California's annual groundwater. Although the results are a statewide assessment; it is important to recognize the statewide findings are not intended to diminish the local importance of groundwater including in the smaller size or lower-use groundwater basins. The Modoc County Board of Supervisors established a Groundwater Resources Advisory Committee to provided local input into the process of implementing SGMA. The Groundwater Resources Advisory Committee meets on the fourth Thursday of every month beginning in February of each year, except for December, when the meeting shall be held on the second Thursday.